Hampton Bays White Rock High Dining Table offers simplicity and versatility to any dining area. Paired with the White Rock High Dining Chair, this set could make a fun addition to your smaller deck or patio space. The Dining Table is constructed of a durable powder-coated steel frame and slat top for easy cleaning. Design the outdoors with this contemporary square end table by CorLiving. The textured black resin rattan weave is complimented by a tinted tempered glass table top . Made with UV resistant materials and a durable steel frame this product is ready to withstand the elements of the outdoors. Pair with any of our PPO patio chairs for a complete set, just attach the legs and this piece is ready to use upon delivery. You no longer have to go out to have a romantic date night! Forget about wait times and enjoy a meal or beverage with your favorite person beside a dazzling flame and beneath the stars any night of the week. The 3-Piece Classic Wicker High Dining Fire Table Set allows you to do just that, minus the smoke and messy cleanup that comes with most outdoor fires. This rust-resistant set features a tempered glass tabletop, and a stainless steel burner that emits 40k BTUs of warmth. The Olefin cushions add the pop of color every patio area needs and are made of polyurethane foam and polyester for true comfort. 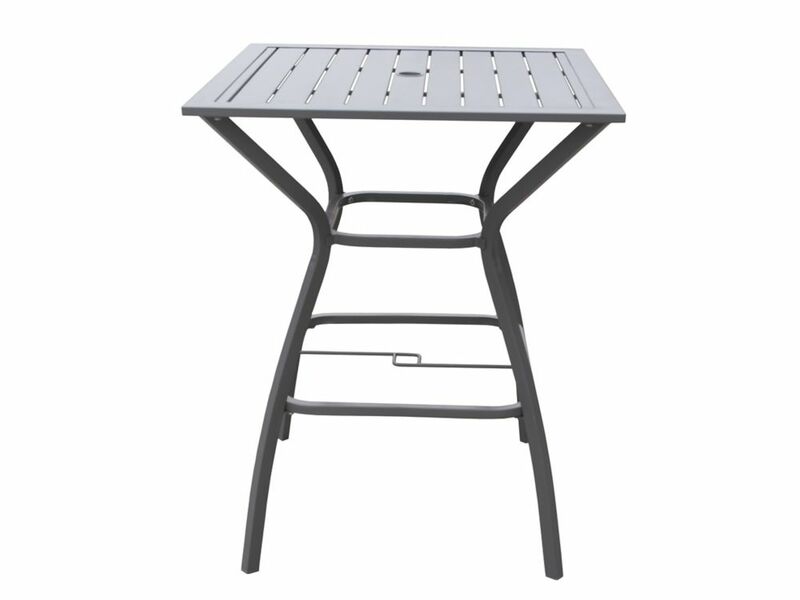 The aluminum bistro table features a rust-free durable aluminum frame for commercial use and helps to create a cozy outdoor dining space. Crafted with an easy-to-clean glass top, this bistro table pairs well with a variety of seating pieces. Its solid, durable design is easy to assemble and made to last for years of enjoyment. White Rock Patio High Dining Table Hampton Bays White Rock High Dining Table offers simplicity and versatility to any dining area. Paired with the White Rock High Dining Chair, this set could make a fun addition to your smaller deck or patio space. The Dining Table is constructed of a durable powder-coated steel frame and slat top for easy cleaning. White Rock Patio High Dining Table is rated 4.3 out of 5 by 9. Rated 4 out of 5 by hovis from Great design, some quality issues We love the design and have purchased another along with 4 matching chair. They have been outside for 3 months now and we find the paint finish could be more durable. Also the weld quality is not that good with blow holes that leak rusty water in some locations. The build quality could be improved to make assembly easier. Some parts have to be stressed to allow screw alignment. When it is assembled it is very stable and rigid. Rated 5 out of 5 by ep64 from first time purchase online The estimated delivery was 30 days, surprised it was here in 2 days. Great service. Great product, very sturdy, with a footrest for us short people. Didn't like the color, but a can of spray paint fixed that. Love it. Rated 5 out of 5 by mama from Looks great! Nice quality; easy to assemble and looks great. Nice size for condo deck. Rated 5 out of 5 by Janice from Perfect Hi For the price a paid it's great! Nothing fancy but it works for what I need it for. It also was delivered so fast which was great. Rated 4 out of 5 by Lyndy Lou from good value I was looking for a counter height table and chairs so I could see over my deck railing when sitting. This set is perfect. Well priced, comfortable and good looking. Rated 4 out of 5 by sharond from Great Table Use this table beside the hot tub to set drinks on. Perfect height. Looked everywhere for a square table that was weather proof. Rated 4 out of 5 by Maxx73 from Decent Deal For a table this inexpensive, it is a good buy. It looks nice and is fairly sturdy. The instructions for assembly are easy in concept, however, expect to be frustrated when actually putting it together as on every piece I got there were screw holes that weren't lined up properly so it is quite difficult to use the cheap allen key they give you to get it together. If you have your own set of allen wrenches, you will be better off to use those. Again though, for the price it's worth it.